These modules are intended to introduce Tusculum University students to some of the library’s online resources. For further instruction or assistance in using any of the library resources, please contact the library via email, phone or visit us in person. A library staff member looks forward to assisting you! The library has a number of sources to help you with your research. We have two campus locations, Greeneville and Knoxville, and all online services are available 24/7. Check out the topics below to learn more about each individual set of services we offer. Students can use their Tusculum ID card to check out print materials from the library. Books are due after three weeks and can be renewed, unless requested by another patron. Periodicals (print journals and magazines), reference works, materials from Special Collections and reserves are available to use in-house only. DVDs are available to be checked out for 1 week, limited to one DVD per student, per check out period. Please return items to the Circulation Desk or via the book return near the front entrance. Notices are mailed when materials become overdue. Library privileges will be withheld until items are returned or bills paid. If materials are not returned after a second notice, an invoice will be sent from the Business Office assessing the borrower $50 replacement cost per book and $100 per video. Borrowing privileges will be suspended and a hold will be placed to prevent receipt of grades, transcripts, diplomas, and/or paychecks until items are returned or replacement costs are paid. Items declared lost by the borrower or that are returned and determined to be damaged beyond repair must be replaced. The borrower will be assessed replacement costs determined by the library on a case by case basis. The both library locations have computers available for general student use. To log into a library lab computer, please use your Tusculum username and password (the one you use to log in to WebAdvisor). The Greeneville library has 5 laptops that can be loaned out to students, faculty and staff for up to four hours at a time. These laptops are for use in the library only and may not leave the building. Please bring your Tusculum identification card when you check out a laptop. All users are required to sign a responsibility form (available at the Circulation Desk) before being loaned a laptop. ID cards will be held at the Circulation desk until the laptop is returned. If you need to print from your own device, ask a staff member at the Circulation desk for instructions on how to connect to our printer network. The desk attendant will provide instructions for making photocopies or printouts. Photocopies and print outs are 10 cents each. Use of the student photocopier allows the use of change or dollar bills. Color printing is available for 25 cents per page at the Greeneville campus location. Please bring a flash drive containing the file you wish to print at the Circulation Desk. If there is a particular book or article you need that the library does not have, you can request it via Inter-Library Loan. The average waiting period for books or print materials is 2 weeks. For journal articles, which are mostly electronic, please allow 3-7 business days. Books may be picked up at either the Greeneville or Knoxville library locations unless other arrangements are made. For alternative delivery options please call (423)636-7320. All borrowed books must be returned to Garland Library in Greeneville or Knoxville by the indicated due date. Borrowers assume full responsibility for the book once they pick it up. If not returned, or returned in a damaged condition, the borrower will be assessed a replacement fee. Articles are most often forwarded to the borrower via email upon receipt by the library. Please be sure to provide an accurate email address when you submit your request. Electronic articles have no due date. PLEASE NOTE: The copyright law of the United States (Title 17, U.S. Code) governs the making of photocopies or other reproductions of copyrighted material. Under certain conditions specified in the law, libraries are authorized to furnish a photocopy or other reproduction. One of these specified conditions is that the photocopy or reproduction is not to be “used for any purpose except private study, scholarship or research.” If a user makes a request for, or later uses, a photocopy or reproduction for purposes in excess of “fair use,” that user may be liable for copyright infringement. This institution reserves the right to refuse to accept a copying order if, in its judgment, fulfillment of the order would involve violation of copyright law. This may apply to software and other non-print formats as well. Reference services and individual instruction on the use of library resources are available upon request. Patrons are encouraged to contact the library with any questions they have regarding the use of library resources, citation help, or general research assistance. A staff member at the Circulation Desk is available to help with general reference questions, or to refer you to a librarian if your question requires a full reference session. One on one sessions may be scheduled with a librarian for specialized assistance, regardless of campus location. Sessions may be conducted in person or over the phone. 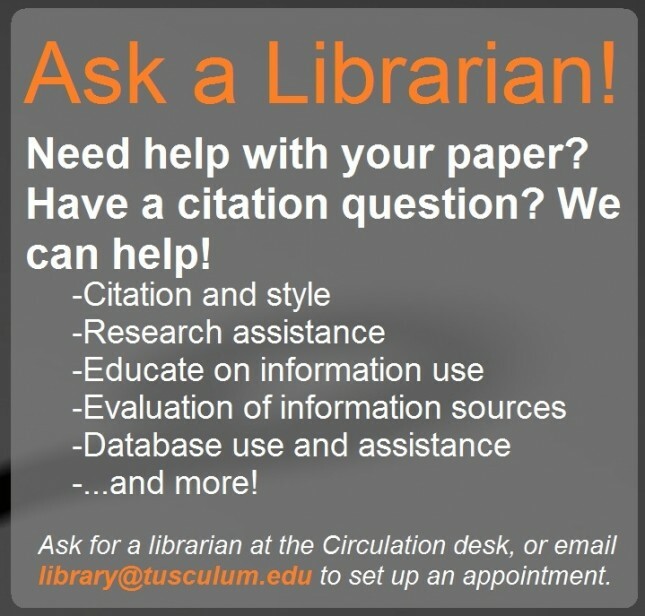 You may also contact the library via email (library@tusculum.edu) or use our Ask Us form for online reference assistance. Please allow at least 1 business day for a response. Both library locations are accessible to all persons who are in need of special assistance. An elevator is located on the main floor. Library users are encouraged to notify staff of any special assistance needed. The area around the library lab computers in both locations is a quiet space. While we encourage group work in the library, please be courteous to others who may be studying around you. Study rooms are available at the Greeneville campus location on a first come, first served basis. Click here to view the full policy. Turn all cell phones on silent or vibrate. Please take calls outside. This is a tobacco and smoke free campus. Please do not bring tobacco products or cigarettes of any kind into the library. Please do not engage in long social conversations with staff and student workers on duty at the Circulation Desk. Now that you have an idea of what the library can do for you, here are some more detailed tutorials on how to use our online services, such as finding e-books in the catalog, or using some of our databases. All users will need to use their last name and Tusculum ID# as login credentials. When prompted for a Name/username, enter your last name. For the Barcode/password, use the following format: t0000 + 7 digit ID# (example: t00001234567). If your ID# number is only 6 digits (123456), add an additional 0 to make the ID# t00000123456. There should be 11 numbers total after the lowercase ‘t’. Should you forget your ID#, you can find it by logging in to WebAdvisor and looking on your transcript. It should also appear on your registration materials. Library staff cannot give out your ID#. Please contact the Registrar’s office if you are still unable find your ID#. Faculty and staff can also find their ID# on their pay stubs, listed as Employee No. Please contact the library with any questions or concerns. Accessing & Searching the Catalog: an overview of the library’s online catalog to find books and audio/visual materials. Accessing & Using ProQuest Central: an overview of ProQuest Central, including how to access and perform searches using the database. Accessing & Using InfoTrac I: an overview of how to access and perform a basic search using InfoTrac I.
Accessing & Using EBSCOhost Web: provides an overview of EBSCOhost Web, how to access individual databases within it and how to perform basic searches. Research can be difficult at times. It’s good to be prepared! The following videos are short and have helpful tips on how to start your search and evaluate the material you find. If you are still struggling, please feel free to contact the library for assistance. A librarian would be happy to meet with you one on one to discuss your research needs either by phone or in person. You can always submit your question via our Ask Us form. The key to good citation is to provide as much information as possible so that information might be verified by all interested readers. Whenever you use an idea that is not yours, be sure to cite it! The way you cite a source depends on the style of citation your professor prefers. Below are links to APA and MLA, both commonly used at Tusculum. The print version of the Publication Manual of the American Psychological Association (APA) 6th edition is available on reserve at both the library’s Greeneville and Knoxville locations. The Oxford Dictionary defines plagiarism as “taking someone else’s work or ideas and passing them off as one’s own.” That includes ‘accidental’ plagiarism, such as improperly paraphrasing or citing a source. This also includes images, video, and music. Cite your sources! Most acts of plagiarism are unintentional, so it is always a good idea to keep track of any material you are citing in your paper or assignment. Ask your professor or a librarian if you have any questions on how to cite a source. When in doubt, cite it! Bad Paraphrase: Paraphrasing is not to make it seem like you are taking less from other sources or to reduce the number of quotes in your paper. It is a common mistake that you need to hide the fact that you rely on other sources. Using quality sources to support your ideas makes them seem stronger and more valid. Actually it is better to show that other sources support your own ideas. A good paraphrase makes the ideas of the original source fit into your paper. It emphasizes the most relevant points and leaves out irrelevant information. Why it’s bad: Look at the way the paragraph is structured. It’s exactly the same as the original quote, with a few sentences moved around. Some words have been changed, but the paragraph still closely resembles the original quote. This is not a legitimate paraphrase because the writer did not demonstrate understanding of the material. They just restated what the original quote said with a few changes. The paraphrase is not in their own words, but those of the author of the quote. Why it’s good: The writer uses their own words to accurately convey the information from the original quote. The source is cited at the end. Check out these resources to learn more about what plagiarism is and how can you can avoid it. What is Plagiarism? : an insightful and accessible breakdown of what constitutes plagiarism. Includes information on using images, music and videos. Plagiarism: How to Avoid It: a video from Bainbridge State College. Plagiarism: this tutorial, courtesy of Dr. Jeff Burleson and based on the Tusculum University Plagiarism Policy, defines what plagiarism is, gives examples of types of plagiarism and how to recognize it. We also have links to a number of resources on our Plagiarism Tutorials page. If you have any questions, please contact the library or email Crystal Johnson (cjohnson@tusculum.edu).